BLOODBOUND, the Swedish Heavy / Power Metal band, has been around for a long time. Last year, in 2014, they celebrated their tenth anniversary. But it wasn’t until 2006 that a first album would see the light of day: “Nosferatu”. This and the following albums were all in all good albums. And that series came to an end with the solid “Unholy Cross” from 2011. You can read my review here. One year later, anno 2012, “In The Name Of Metal” came out. I didn’t check out the album at all, because back then I was already fed up with all those songs about Metal, about how great the music is (compared to Pop and other genres), about what a great community is brings together, blablabla. Such songs have been writing since Metal was branded Metal. No need to repeat it all the time, we all know that Metal (in its various forms) is a great music genre. Two years after that commercial step, “Stormborn” came out and this in November 2014. Eleven tracks, including an intro. It all begins with the mysterious and dark “Bloodtale”. A speech is added to make it more lively. “Satanic Panic” – oh, it rhymes – kicks in next with catchy leadwork and uptempo Power Metal. Screaming vocals instead of regular singing: not bad, but it sounds overdone, as if Patrik is exceeding his limits. A hymnic bridge connects with a sing-along, midtempo chorus in vein of GRAVE DIGGER, POWERWOLF, NIGHTMARE, … Later on, after the solo, all Metal stops and you get only a choir and an organ for the chorus. Well, this sounds quite like POWERWOLF, no? Afterwards it’s back to business as usual. All in all, a good song to start with. “Iron Throne” is next with very nice singing, backed by the same melody. This song has something SABATON-ish. It’s bombastic, fast and melodic. Here the bridge is pounding and Patrik screams again. The catchy chorus is sung in a regular way, which is much better. Four further songs are worth checking, beginning with “We Raise The Dead”: This is a straight-forward song, in vein of HAMMERFALL and MANOWAR. But once the melody kicks in in the bridge and chorus, I had to think of EDGUY (or AVANTASIA) in terms of bombast. 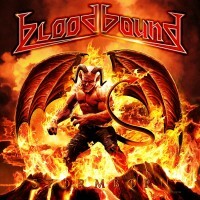 “Blood Of My Blood” is another high-speed song with screamy vocals in the bridge. The chorus is of the midtempo kind and pretty hymnic. There’s also enough room for solos. “Seven Hells”, like a few other songs, begins with a building intro, after which uptempo Metal is unleashed. A hymnic chorus makes it complete. “When All Lights Fail” is another powerful track with raging guitars and thundering drums. Galopping verses and a bombastic, hymnic chorus create a nice marriage. And now, the less good or strong songs, starting with “Nightmares From The Grave”. This is a fast track, typically BLOODBOUND, so it should be good, right? Contrast is created between the verses and Folky, hymnic bridge and chorus. A returning solo (with the help of backing bagpipes?) serves to link up with the verses. Later on, the chorus is sung by a youth choir, after which the band takes over again. The title track, “Stormborn”, begins in a bombastic and dark way. A choir is again present. Midtempo Heavy Metal is on offer after this, while keyboards operate from the back for accents. It’s a very linear song, not fast at all, but also not diverse enough, which makes it a drag to listen to. “Made Of Steel”… yay, another hail Metal song. Seriously? Well, you know, think HAMMERFALL, MANOWAR and similar. “When The Kingdom Will Fall” begins with marching troops and the band following that pattern, as do the drums. Vocals are done by form of choir. When the music is let loose, you get a midtempo, hymnic kind of song. Again the keyboards operate from the back, assisting in bombastic additions. “Unholy Cross” (and previous releases) was, compared to “Stormborn”, more diverse, had more strong songs, is more inviting to multiple listens. The new album is perhaps again a step in the right direction, but there are too many songs that just don’t really cut it, hence making this album not that recommended. It’s good for in-between, and for the die-hard fans, but if you’re looking for add BLOODBOUND to your collection, “Stormborn” is not the album to start with.